Violence in Chicago is making headlines nationwide, again. Murders are up, and more kids were shot this past school year than the year before. 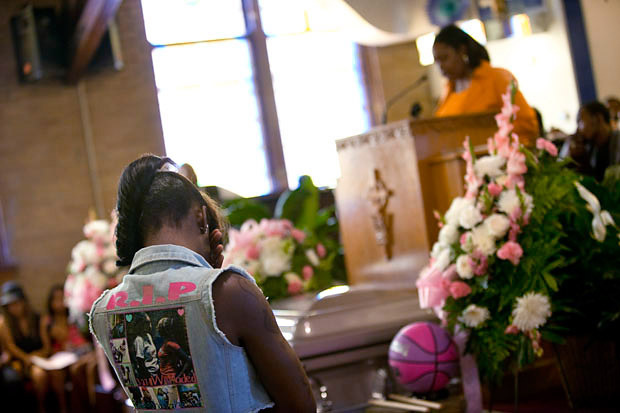 The weight of the city’s struggle with violence falls heavier on some than on others. One person shouldering a lot is the principal of a South Side high school. WBEZ talked with her recently. She was at the funeral of one of her students. You hear about the bullets that find the kids. Kids shot on the block where they live. Kids shot on the way to school. Kids shot while they play. SANDERS: Basically I do come to all the funerals. Leonetta Sanders is principal at Harper High School in the Englewood neighborhood. 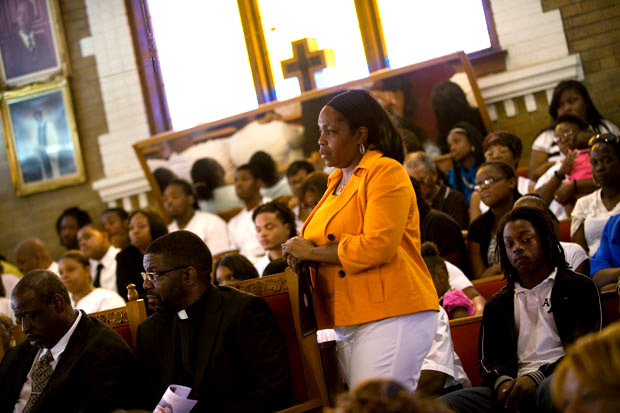 But on this day, she’s also a mourner, one of hundreds overflowing a little church at 88th and Hermitage. She is wearing a bright orange shirt, the color of lilies and popsicles. One floor above us, in the sanctuary, the casket is covered with flowers. 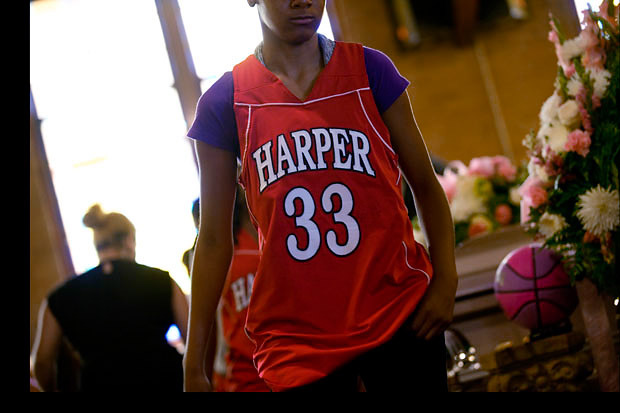 Shakaki Asphy was 16, just finished sophomore year, a girl who loved basketball and playing the drums. She was shot on a porch talking to friends. Principals think about numbers all the time. Test scores and attendance and dropout rates. This year, Sanders is counting funerals, too. SANDERS: It would be eight total, with current and former students. Sometimes, she cannot even get to the funeral, before the next gun comes out. SANDERS: We are literally picking up students in the morning in our own cars and bringing them to school because they cannot walk through certain areas. Yesterday morning for example I had a student walking down Wood from 63rd to 65th, and he was shot at. He was shot at—yesterday morning. Sanders sometimes dreams she could pick up her whole school and plunk it down a few blocks away, so she could get Harper High out of these raging gang wars. SANDERS: Starting last June I started a binder, known as the Harper High School Victim and Offenders Binder. One day after—and I can’t remember which incident—I just started a list…. Sanders’ list stretches across two sheets of paper. It’s 27 names total, all current or former Harper students. Nineteen shot. Eight dead. One school year. SANDERS: As I wrote the list, tears just ran down my face. Because it’s different when you see it like this. When you see the total number of students in one high school that have been affected by gun violence. SANDERS: And I sit back and I just say, Wow. Is anyone else looking at this data? Because every couple of weeks I’m adding another name. Then she had to add Shakaki Asphy’s name. SANDERS: With Shakaki’s death, a lot of staff members broke down. I found out Sunday morning at like 7:45 when they called me. I was getting ready for church, and I couldn’t even go, because I broke down the whole day. I had to call my psychologist and my social worker, because I didn’t think I could continue this work. Basically, Sanders’ school is in a war zone. SANDERS: I had to call one of Shakaki’s teachers, and she just screamed on the phone. The social worker that worked with her fell out. And so when I knew all this was going on I had to gather myself together and the first thing I did was just go in my bathroom and pray. And I just prayed for God to give me the strength to deal with this. 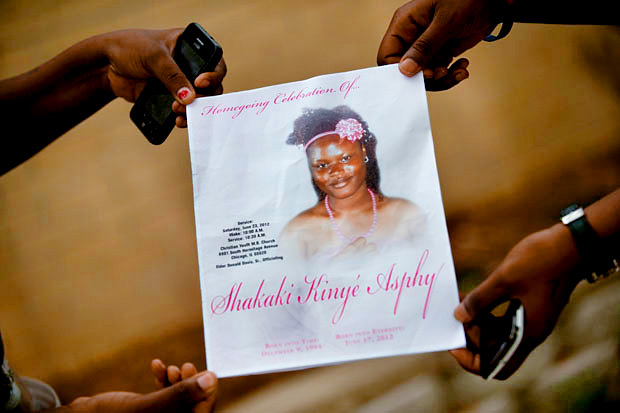 At the funeral, Shakaki&apos;s mother cried out in pain, her wails pulled tears from the hundreds who packed the church. From the pulpit, principal Sanders read a resolution from Harper High. The girls basketball coach spoke. 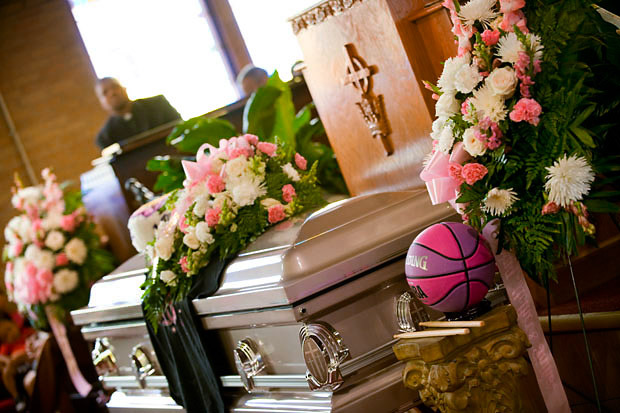 Shakaki’s teammates stood near her casket, dressed in their red jerseys. Sanders says, for her, the most painful thing about all this is how it affects her students. She says recently, some Harper alumni came back to visit. SANDERS: I had a student in there, his name is Deonte Tanner. And he said, ‘Do you know what me and my friends talked about at the end of the school day, the last day of school?’ And he said, ‘Which one of us won’t make it back in August.’ What kind of conversation is that for children to have? Sanders says it’s not that people aren’t trying. She says she can’t imagine a better staff. When she asks the police commander for more cars at dismissal, she always gets them. CPS found more than 200 summer jobs for Harper students. SANDERS: But it’s still a missing component. I mean, I don’t have the magic, I don’t even know what the magic is that will stop this. But something has to be done. Something has to be done. SANDERS: I pray every day, all day for my children, that I don’t get another call stating that another student has been killed. We just started the summer. I got a long summer to go. Christian Youth MB Choir: "Goin&apos; Up Yonder"